And here it is. A sneak preview of the new 3CX Assistant. What will it do? Well its an easy to use utility to allow users to manage their extension - take, transfer or park calls. It works in tandem with any phone. It also shows presence of all other users, and can be used to see Queue status as well if you have the rights. We are working on a beta, which should be available in a few weeks time. It looks great. I've been waiting to see this since it I heard it was coming. 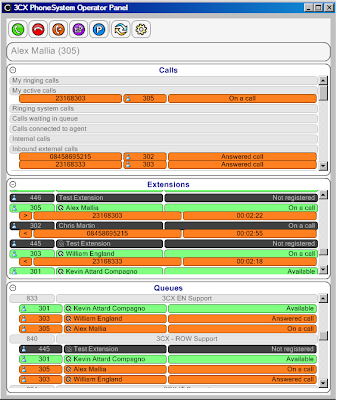 I used a similar tool on a Lucent system and it is *very* useful for call centre management. I didn't expect to see this on your blog. Hmmm...it has a different look from current voipclient and 3CX gui...look interesting Nick. Yes look is slightly different. We have not decided on it yet, but we might test run this look. What do you think of this more colorful look? I think this will be great! I have some clients with call centers and we know that this will be a great selling point. Can't wait to get my hands on it. Why do not use standard expanding nodes as it done in 3CX admin console? I think it should be more standard (windows interface standard). Maybe its best to use ribbon interface, because in future Windows versions it is a standard interface design. We are just in the early stages of planning/testing our implementation. I was hoping for an interface where you could start typing in a name/extension and get intellisense type response as to the status of that person. It is a little non-windows style. I realize it's still early so that is my 2 cents worth. hot for it - let me get it soonest. Seems to be helpful for both callcenter and receptionists. 3cx is great - but the best is your support. Proud to run + sell 3cx. We hope to release something next week and look forward to your feedback! I have some comments about the new 3CX Assistant. 1. For Version 1, great. 2. I would prefer when I could sort the name by lastname or forename. In a greater company the lastnmae is mit known. 3. The extensions should be sort by alphabetical order. 5.When I minimize an extension, the extension became maximized after refresh. I hope you will find my comments helpfully to improve your very good software. Thanks for the feedback, very helpful. I agree with better sorting capability as well as the ability to turn off the pop up as well as the ability to hide extensions. I did not understand point 5, could you elaborate? With a double click at the group header of one extension I'm be able to retract or extract an extension. Situation 1: I can see all members of an extension. With a double click at the group header I get situation 2. Situation 2: I can just see the group header but not the members of an extansion. With a double click at the group haeder I get situation 1. Now when I have situation 2 and make a refresh then I have automatically situation 1. I didnt follow, sorry. Extensions dont have members? Sorry I try it again. If I group extensions then I see the name of the group and the members of the group (extensions) in the rubric "Extensions". And now, if I double click at a group name neither I can see the members of the group or not. But after refreshing I see always the members of a group undependant of the situation before refreshing. Understood, yes, we will fix this for RC2... Thanks! I'm not sure whether this blog is the right way or the way you wish to submit suggestions or bugs. If not, please tell me which is the best way to submit such things to you or any other people in your company. Is there any API or other kind of interface to collect the status of extensions and to use this information in other software?